Have you been chosen by our King to stand in the gap for His Jewish people in an Esther-like capacity? 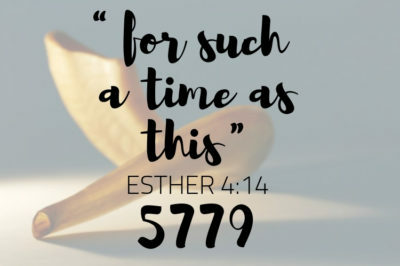 In ancient times, God placed a young woman named Esther in a position of royal authority so she could intercede for the salvation of the Jews. (Esther 4:12-16) In the past 25 years of ministry, we have watched Him raise up Esther-like companies of intercessors and advocates for Israel around the world. If you are one of them, you are favored and honored! The King wants you in His royal dwelling, easily summoned in to His personal presence. He calls you to enjoy a unique intimacy with His heart. Because of that intimacy, your behind-the-scenes ministry of intercession can potentially shape history. You may have an audience with the King which others will not share. This 5779, we strongly encourage God’s Esthers to joyfully stay the course, expecting both victory and vindication by their King. Some prophetic Christian leaders have said they foresee 5779 as a year of escalated fruitfulness or reaping for many believers, related to prior years of sowing and cultivating. They expect major changes, or promotions, in ministry assignments to occur. If their predictions come to pass, many of today’s Esthers may be blessed with new realms of service to the King. But even if the predictions do not prove true, the Bible states as a general principle that we reap what we sow. (Galatians 6:7) God promotes those who steadfastly serve Him. (Matthew 25:21) Therefore, good and faithful servants can generally expect Him to increase the scope of responsibility and authority entrusted to them. 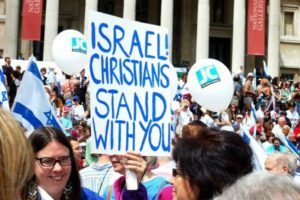 If a Christian leader or ministry from abroad acquires a visibly active presence inside Israel, it must demonstrate to the Israeli government that it does not and will not seek to advance the Gospel or faith in Yeshua.To meet these requirements, several Christian leaders have recently made troubling statements. In the past year alone, some have unabashedly announced they will not share the way of salvation with the Jews and/or do not believe Jews need to be saved from their sins. Others have overtly apologized for having said in the past that Jewish people need salvation. To back up these statements, Christians from abroad must publicly and as a matter of policy, distance themselves from Messianic Jewish brothers and sisters. The Israeli media is quick to pick up and report on news of this nature. Perhaps more troubling is that, when Gentile Christian leaders overtly disassociate from Jews who follow Jesus, they unintentionally solidify Israel’s stance against Messianic faith. These leaders do not realize their disassociation from Messianic Jews would presumably include all the New Covenant apostles and Yeshua Himself. Not surprisingly, when this happens the anti-Messiah stronghold over Israel is unintentionally empowered. Persecution against Israeli believers usually worsens. To be fair, unique sensitivities are involved in Jewish-Christian relations. A long history of Church sponsored anti-Semitism has tainted the Jewish perception of Christianity. Against this background, when modern evangelicals tried to demonstrate unconditional love and bless the Jewish people, they encountered skepticism and distrust. Israelis felt the evangelicals were ultimately only interested in converting them to Christianity, or hastening the fulfillment of prophecy, or both. It therefore became necessary, as a first step, to establish trust through genuine friendship. To be sure, genuine friendship between Christians and Jews is very good and important. Unfortunately, “genuine” friendship soon came to mean not sharing the Gospel in which one placed one’s genuine, personal hope, with one’s new friends. Meanwhile, years have passed. Today is a new day, even a new year. At the start of 5779, we think it’s time for the next step. In 5779, 70 years after the establishment of the State of Israel, the Jewish nation and international Church have reached new levels of maturity. Increasingly, Jews understand that true Christians will love them even if they never confess faith in Yeshua. And so, as a next step, could it be time for evangelicals who genuinely love the Jewish people to stop intentionally withholding the Gospel from them? The Master tells us to make disciples of all nations, not excluding Israel—lovingly, courageously, prayerfully and of course, sensitively. In 5779 and beyond, how can you bless Israel in the spirit of Esther or Mordecai with integrity to the Gospel, as well as sensitivity to the wounds of anti-Semitism? One guideline can be found in the last sentence of the book of Esther itself. Speaking of Mordecai, the Scripture describes him as one who “worked for the good of his people and spoke for the welfare and peace of his whole nation.” (Esther 10:3, AMP) The Hebrew for “his whole nation” literally means “all his seed.” For that reason some Bible translations read, “all the Jews.” The point is Mordecai did good for all of his Jewish brothers and sisters. According to Galatians 6:10, “As we have opportunity, let us do good to all people, especially to those who belong to the family of believers.” (NET) On a practical level, ministry for the good of all Israel is usually best achieved by co-laboring, at least to an extent, with Israeli Messianic Jews in the family of faith. This we would encourage nearly all of God’s Esthers to do. At the same time, we wholeheartedly thank God’s Esthers who already openly align with Jewish followers of Jesus in Israel, the US and other communities where they’ve met with resistance from traditional religious or secular Jews. Some of you have paid a high price. You have sacrificed prestige, ministry vision, finances and more. You have not succumbed to “fear of the Jews.” (John 7:13) Your names are honored in heaven. Let us keep in mind that Yeshua prayed that His followers be “brought to complete unity. Then the world will know You sent Me.” A clear evangelism strategy for all nations, including Israel, is the open display of loving unity among believers, Jewish and Gentile. This display will be a prophetic sign of the “fullness of the Gentiles” (sometimes mistranslated, “full number of the Gentiles”). Romans 11:25 states, “A partial hardening has come upon Israel until the fullness of the Gentiles has come in; and in this way all Israel will be saved …” The fullness of the Gentiles does not refer to a quantitative full number, but a qualitative fullness of the Spirit that provokes Jews to jealousy for their God. (Romans 11:11) It gives rise to unity with the brethren, which in turn draws Israel and the nations to Messiah. God wants Israelis to see and experience this supernatural unity on a national scale between Gentile and Jewish followers of Yeshua. In 5779, we believe it is time. Esthers, will you help pave the way?